Former Kid in the Hall Mark McKinney now lives in New York and has worked to shed the label of "comic" by making a name for himself there as an actor. Though the Winter garden is the wrong venue and the show needs crisper direction, the popular off-Broadway play "Fully Committed" now making its first Canadian appearance provides the perfect showcase for McKinney's abundant talents. "Fully Committed" made its first appearance at the Adirondack Theatre Festival in 1998. Playwright Becky Mode based the play on the experiences of her friend actor Mark Setlock who was the "reservationist" for a four-star restaurant in Upper East Side Manhattan. When Setlock worked there, the restaurant, like that in the play, was the eatery du jour in the city. The restaurant's fame and high prices created an aura of exclusivity so that anyone who was anybody, or who thought they were somebody, absolutely had to eat there as a mark of privilege. It is status not food that every one of the characters hungers after. The play may focus on New Yorkers as a particularly ravenous bunch, but we all have encountered examples of obnoxious me-firstism even among supposedly self-effacing Canadians. It is the role of the reservationist Sam to direct the rogue's gallery of more than 30 ego-trippers, sometime on four different phone lines, as best he can. The aural assault includes not just people trying to score the table number 31 in the restaurant, a visit by the Zagats and a photographer from "Gourmet", but also the more arrogant members of the restaurant staff, chief of whom is the star chef who makes Sam use the pretentious title phrase instead of "fully booked". But even Sam himself hungers for status. Like many in the "food service industry" he is "really" an actor and longs to have that second call-back for a show at Lincoln Center so he can leave the cacophony of his basement office behind. While "Fully Committed" seems more like an 80-minute comic sketch than a full-fledged play, it is an extremely cleverly written sketch. The show's basis in reality and Mode's ear for natural dialogue keep the satire sharp. Though structured entirely as a series of interrupted phone calls between Sam and patrons, staff, friends and family, the play's increasing number of plot threads are not difficult to keep separate. Yet, having to keep so many conversations mentally on hold makes the show less a laugh riot that one might expect simply because the audience is so keen not to miss a single word. Making a play like this clear requires tour de force acting and Mark McKinney certainly delivers. 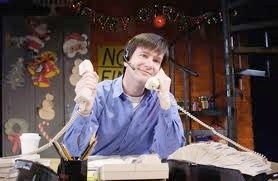 He is amazingly precise in keeping the 30 plus callers' voices absolutely distinct. Most often he uses only voice placement, accent and facial expression to characterize them. Sometimes he adds gestures. And for Jean Claude the maître d', the chef and Curtis at Lincoln Center Frances Aronson's lighting changes signal the callers' locations. Some of McKinney's most memorable creations are Sam's folksy, recently widowed father; the emotive French maître d'; the slick, mind-game-playing chef; prissy Brice, personal assistant to Naomi Campbell, who insists on a vegan "menu de dégustation" for fifteen plus a change of the restaurant's lighting; the abrasive Mrs. Sebag, distraught that her reservation has been lost; the determined 82-year old woman who wants her AARP discount after the fact; and the irate socialite who repeated calls back to speak with Jean Claude about what she deems an "emergency". Oddly enough, the character we have the least clear view of is Sam himself. In the short space of the show we see him throw off his innocence and change from a put-upon nice guy to someone who decides that to have success in the real world connections are more important than talent. Yet despite this change Sam still comes across as rather bland. Daniel Goldstein has restaged the show, as he has done elsewhere, from the original direction by Nicholas Martin. One can't help feeling that something has been lost in the translation since the pacing tends to inhibit rather than reinforce the sense of comedy. We expect that this kind of play will build and build to a kind of frenzy, when in fact Goldstein keeps McKinney at the same energy level throughout and allows the action to drag when it should speed up. James Noone's set captures Mode's vision of a world off kilter by having the floor and ceiling of Sam's basement office askew and by painting all five surfaces in clashing colours. There is no doubt that a play set in a cramped space and relying entirely on phone conversations and facial gestures would have much greater impact in a smaller venue. The Vineyard Theatre, where the play made its splash in New York has only 120 seats. It then transferred for a sold-out run at the Cherry Lane Theater with 180 seats. The Winter Garden with 992 is far too big. This tells me that Toronto really needs a theatre venue other than the New Yorker where an off-Broadway show like this can play to better advantage. Nevertheless, even if the ambiance isn't right and the pacing too leisurely, Mark McKinney serves up this tasting menu of comic types with a panache that should please any palate. Photo: Mark McKinnpy. ©2001 Sooke Productions.